Just when I thought I had completed most of this game, I found out there are more jobs available today. Here's the list of all the jobs. Oh dear, looks like more time is needed to get them all. I have been trying to get Ray Coffer to get the highest of everything since he is one of the first staff. He has become a 5-Star Chef. He's working on the Floor area at the moment, being a Roller Skater. It's so cute the way he moves about in the restaurant. Serena Lam is another staff that works for me right from day one. She has also finished all the training in the kitchen. At the moment she is playing the violin, being a Musician, on the Floor area. To read about how to power leveling your staff, please click Here. Enna, I have yet to find out how to unlock musician,ninja,roller skater, recipe master,popular staff,animal trainer, and kairo staff. I have performer though. Is there some special way to obtain these? Using the Table above, you can see the requirements for each job is a little different. 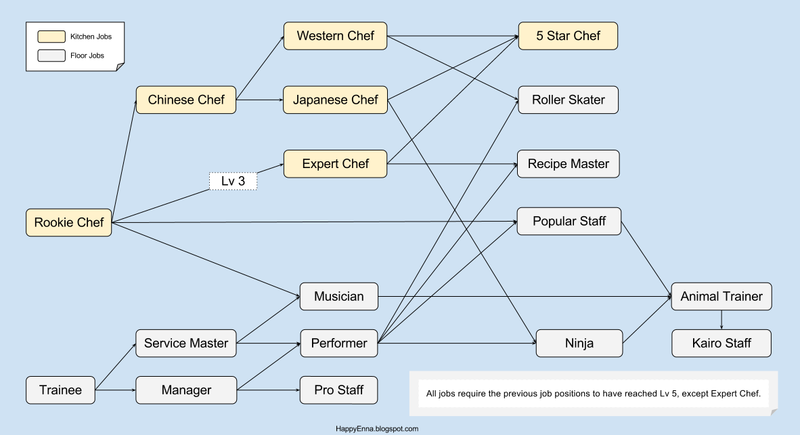 For example, Musician requires the staff to have Service Master Lv5, and Rookie Chef Lv5. On the left side of Musician box, it's linked to Service Master and Rookie Chef. 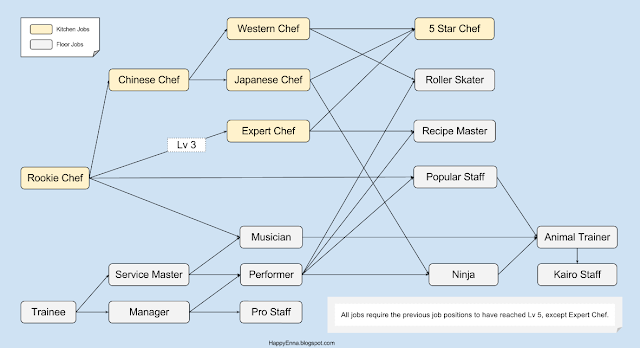 It means you need both Service Master and Rookie Chef to reach level 5 before you have the option to become Musician. If it's all too complicated to work out, the trick is to swap your staff between floor jobs and kitchen jobs every so often. Sooner or later you will discover all the jobs. Enna, you are actually featured in Kairosoft Wiki! will the staff be too expensive?Will the highest level job make more profits? If your staff are well trained, dishes are well developed, you'll find it easy to pay expensive staff. High level jobs are better than low level jobs since they give much better boosts. Hi Enna! i wanted to know.......is the game free or do u have to pay for the game.......? I am trying to get a Ninja, but I just got to pro staff. Help, please! :D hehe, aww, sorry I see your message so late but I'm glad you found the chart. ^_^ Hope you had fun with the game. is the kairo staff the best job? I'd say it is. It takes a while to get to that rank though. Go to the place where u buy all ur furnishings. The first with the flooring should have door, hammer, hammer, clear box pictures before the flooring. Hover over the clear box it should say rearrange. So click on rearrange and it will go to ur apartments where u click on the furniture u want moved and move it somewhere else. Hotelierjobz.com offering departments in hospitality career like Front Office Rooms Division Jobs, Housekeeping Jobs, Laundry Jobs, Food & Beverage Service Jobs, Food Production Kitchen Jobs, Kitchen stewarding Jobs, Finance Accounts Jobs, IT and Computers Jobs, Human Resources Training Jobs. This blog is really great! Thanks for the useful tips! Really good job done on the article. Thanks for sharing your views.